Over the last few months we’ve been making lots of decisions – about jobs, where to live and travel. In the end, we’ve decided to move back to Sydney. It seems to make sense for a lot of reasons but at the same time it’s really sad as we have to move away from friends all over again and leave London behind. The exciting part of this decision though is that we’re not going straight home. Instead we’re going to travel for a number of months, with a couple spent driving along the west coast of the USA. It puts a slight hold on my cheese making but I’m hoping to make up for it by trying lots of new cheeses and learning about cheese-makers in California, Oregon and Washington. This is also where I’d love some help. I’m new to American artisan cheese and would love any suggestions of places I shouldn’t miss. I’m never really sure if I should write about my disasters. But, as I promised an update, it seems like the story of my ash-coated goats cheese remains incomplete without an ending. Sadly, there isn’t much more that needs to be told other than I had to clean my teeth very quickly after trying it (and Nick wasn’t going to even contemplate a bite). There were a number of problems. First, as you might see above, the rind was separating quite badly. Second, the taste was quite bitter (the exception was the firmer centre, which tasted more like chevre although not as light or lemony as fresh cheese). Finally, although I know appearance in cheese isn’t everything, the ash did make it look unappetizing. There are so many variables that could have caused these issues but I think it might have been too moist and perhaps also insufficiently salted. Anyway, I’m not too fussed; it was a good experiment and it just makes me want to try making more. Alessandra Zecchini writes, amongst other things, a New Zealand blog that is full of food that I want to cook. My recipe for haloumi came from her site. Recently, I saw that she had started a monthly blogging event called Sweet New Zealand, which is for kiwi bloggers cooking sweet things, and it made me think that I’d like to be involved in something like that, only with cheese. So I’ve decided to start doing a monthly post of cheese-related recipes. I’d love others to take part too – so if anyone else happens to be keen, let me know (360degreescheese(at)gmail.com) and we can start posting a collection each month. 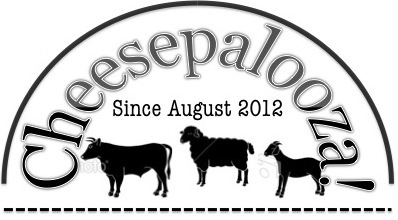 Admittedly, it might end up just being me but if anyone else has old or new posts where cheese is a key ingredient, send me a link and I’ll put them together into single post – like a recipe log of cheese that can be shared. 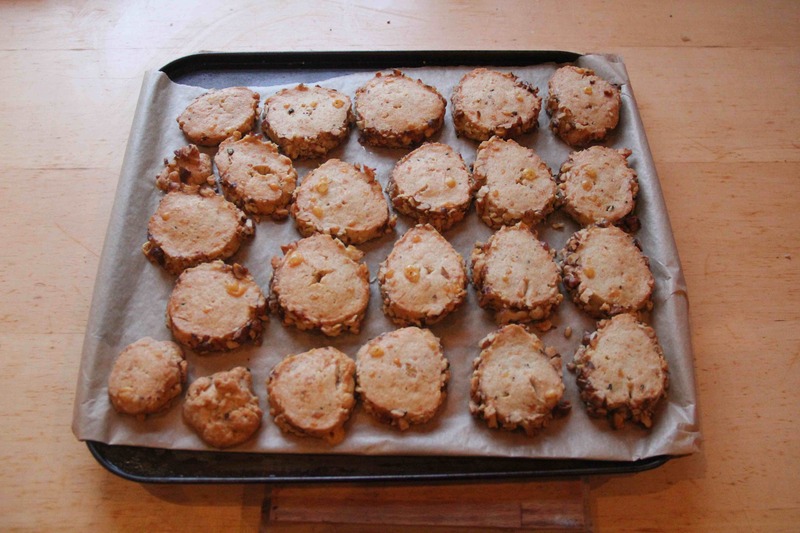 To start, I made these blue cheese and walnut shortbread. The recipe comes from Leite’s Culinaria and it seemed like a good use for the large chunks of blue cheese that I had in my fridge. We had a few the other night with a 2004 Rioja, and the combination brought out the pepper in the biscuits and the spice in the wine; a goodway to spend a wet and cold evening at home. Take around 110 grams unsalted butter, at room temperature (I had only slightly salted butter, so used that and left out the extra salt I mention below) and around 250-300g of blue cheese, crumbled. Put these in a bowl and cream together with a wooden spoon until it is a smoothish paste (you could also use a food processor but I don’t have one). 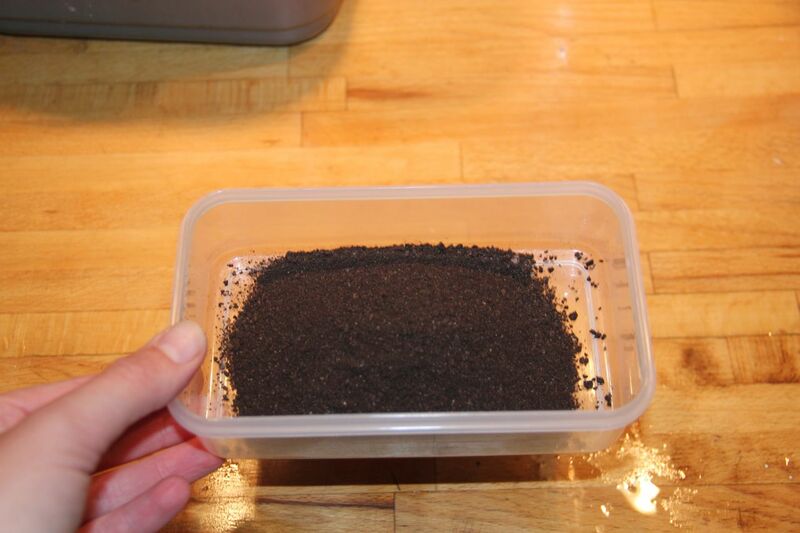 Get 1.5 cups of plain flour and mix with 1 teaspoon freshly ground pepper and 1/2-1 teaspoon salt (if using). Add some of this dry mixture to the cheese/butter paste and mix with a wooden spoon in a fast (but light) chopping motion and keep adding more flour the mixture resembles large breadcrumbs. (The ‘fast-light’ chopping motion might sound odd, but I found dashing the spoon through the mixture meant it didn’t clump together and let the large bits break up). 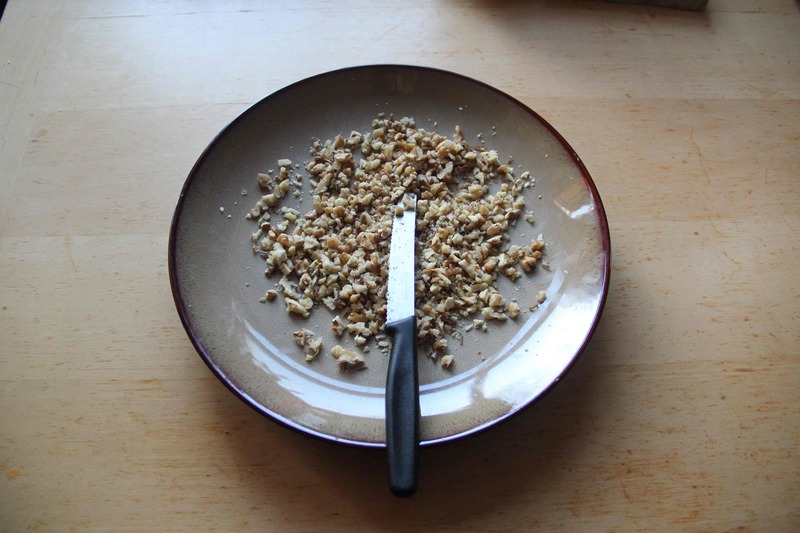 At this point, take 1/4 cup of walnuts and chop/pound/break them up into small bits. Put aside. 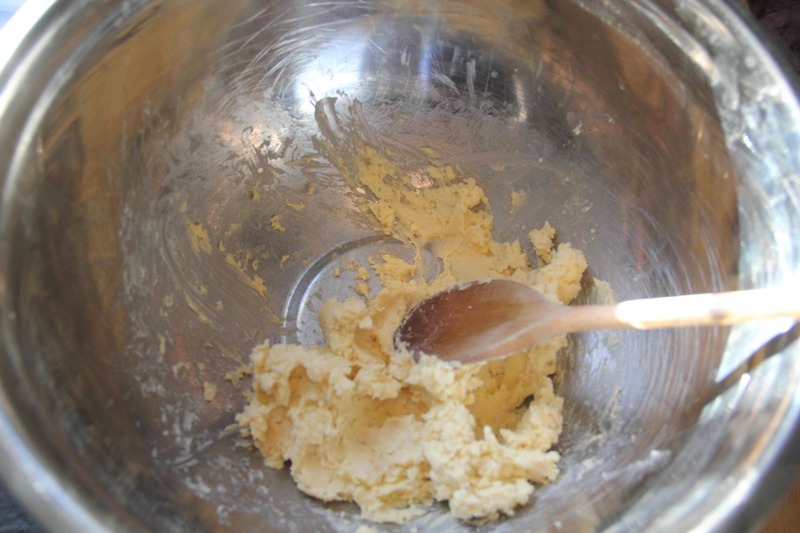 Add 1 tablespoon cold water and mix until the dough comes together. 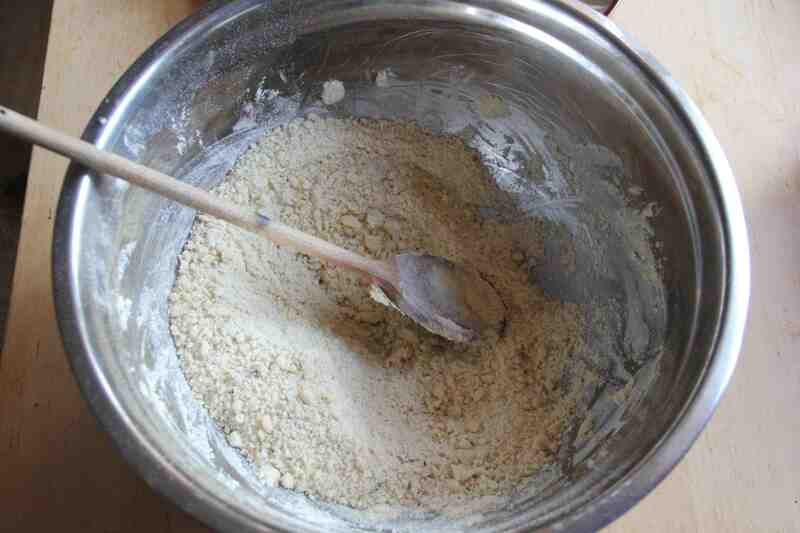 Put the dough onto a floured work surface and roll it into a log that is about 3-4 cm wide in diameter. Brush it with a lightly beaten egg and roll it in the chopped walnuts so that they cover the length of the log. Finally wrap it in cling wrap and place in the fridge for at least 30 minutes. Once you are nearly ready to cook the biscuits, pre-heat the oven to 175C (the recipe says 176C but my oven is nowhere near that precise!) and cover a lightly-greased flat baking tray in baking paper. Remove the log from the fridge and cut it into1-1.5cm rounds. 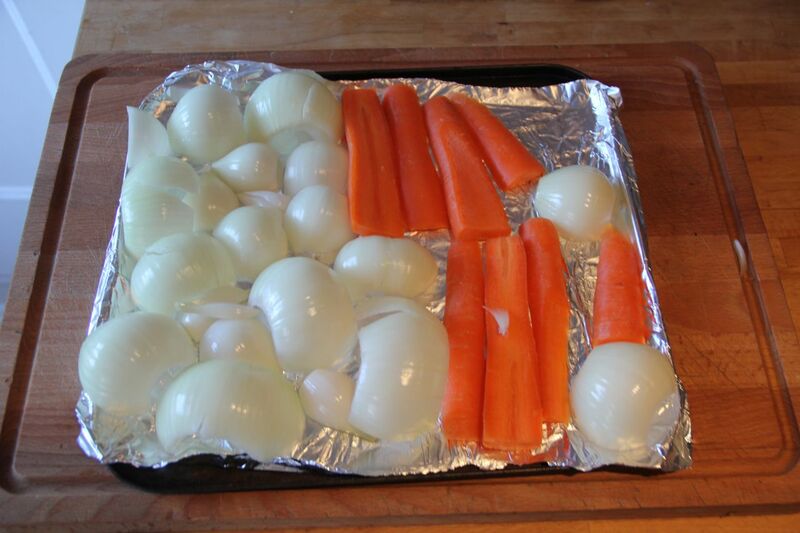 Place these on the baking tray and cook for 20-22 minutes. You want them to be all golden, so check them around 10 minutes or so, and spin the baking tray around. Once they are ready, remove and let them cool. Eat! 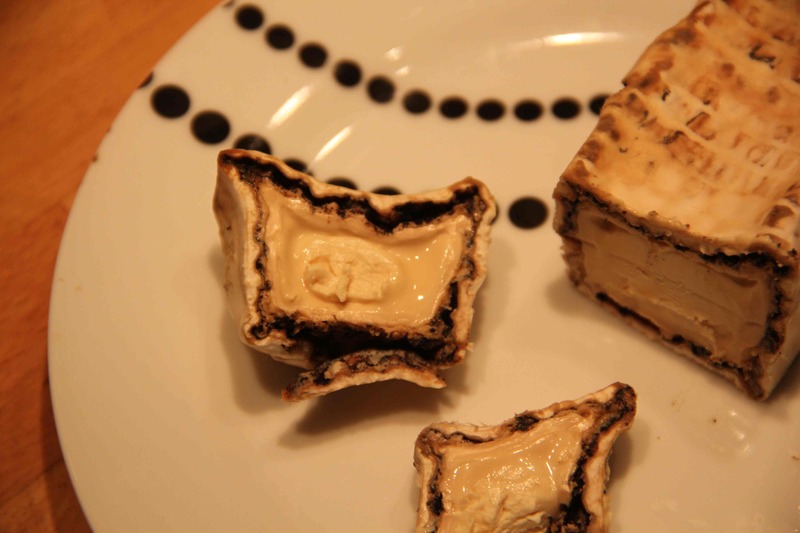 One of my favourite cheeses is Valencay. It is crumbly, gooey and then has the sharp taste of ash. My latest cheese is based on that idea. I didn’t have any pyramid moulds, so I placed some of the curds in a cheddar mould and let them drain. I also hung some of the curds and then hand-shaped them into a log. 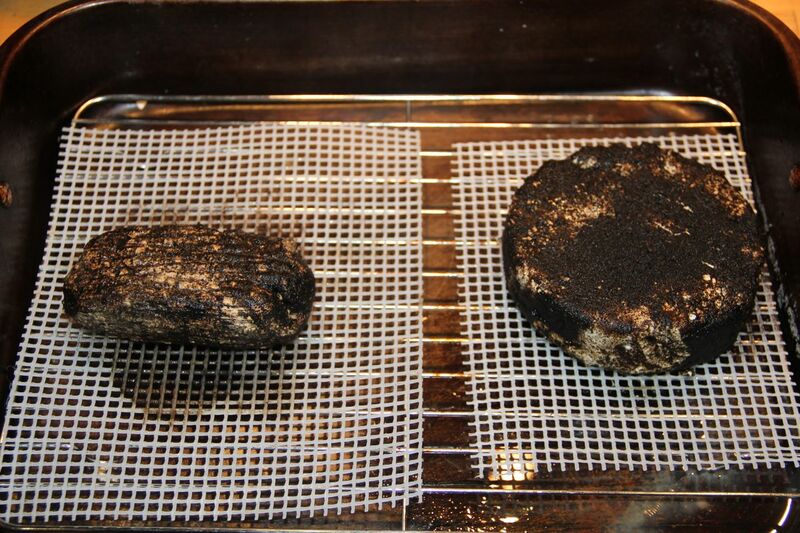 After coating the drained curds in my vegetable ash, I let them dry. They were then kept in a humid esky at about 7-10C for the last week. The log is going well. 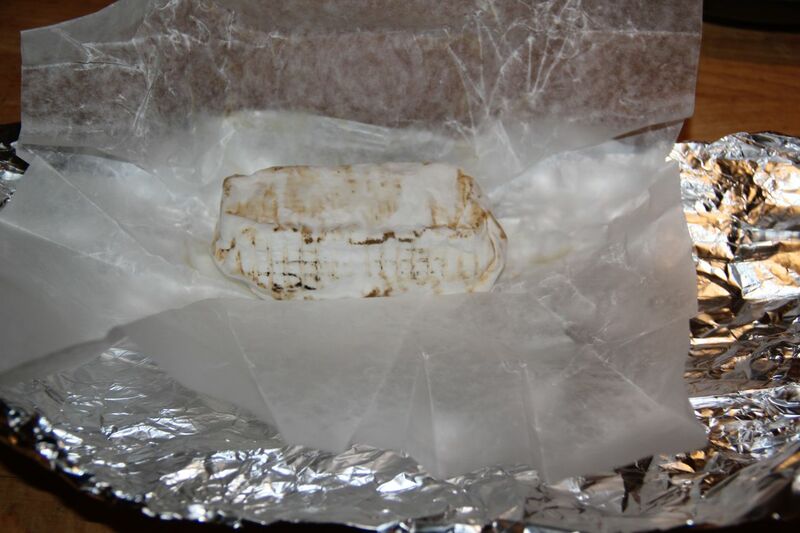 It has a clean covering of white fuzzy mould, so I’ve wrapped it in waxed cheese paper and am going to let it age for about 1 more week. The round is proving more problematic. 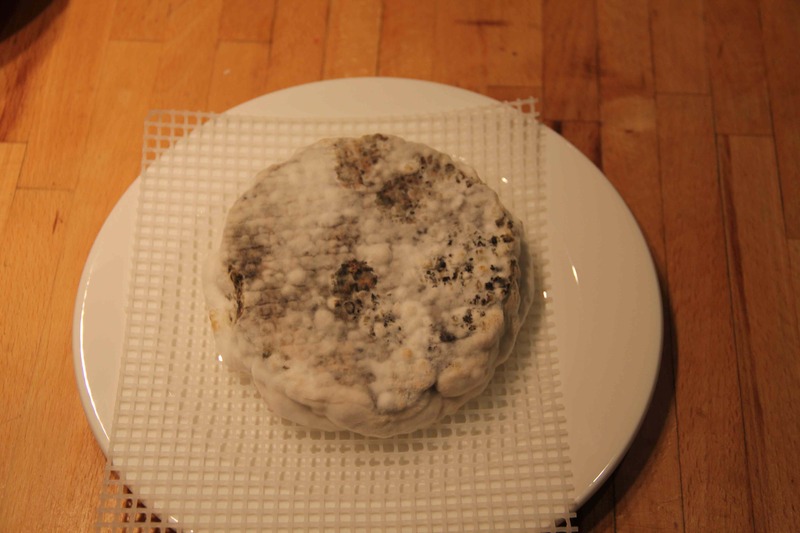 It was really moist for a long time and has developed a much more patchy and thick rind of white growth – I’m not sure if it’s all good mould either. I’ve wrapped it up as well and will have a look again in a few days. I don’t expect much from it at this stage though. When I decided to make goats cheese on the weekend, I didn’t let the first set of curds sit for long enough, so they didn’t coagulate properly and I managed to break them up too much when I tried to scoop them, so I needed to start again. As I needed to wait for a further 12-16 hours, I had some time on my hands, so decided to make some ash for coating the cheese. 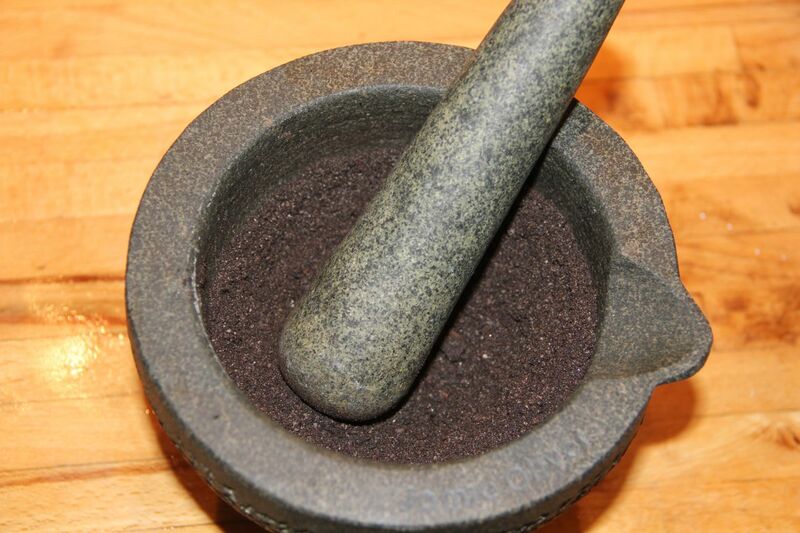 There are numerous posts out there on the various methods for making ash online, ranging from very specific scientific devices, through to the use of clean paint cans. I went for a much more simple approach. 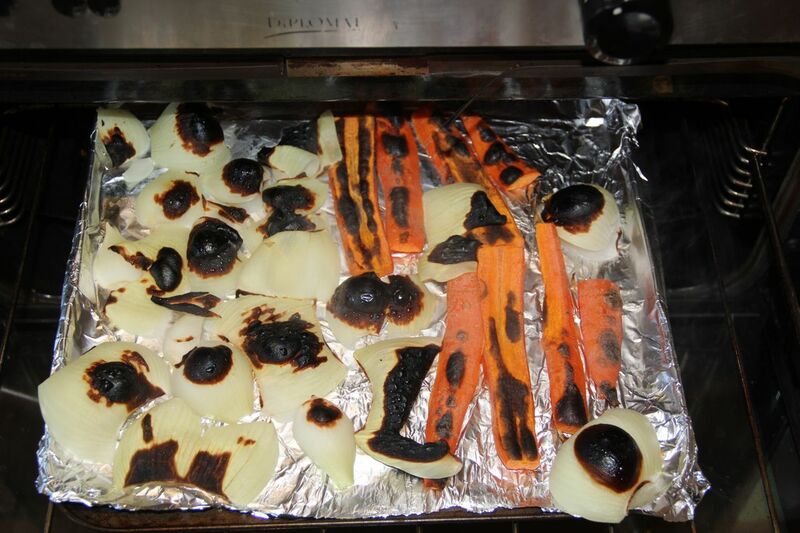 I sliced 2 carrots and separated out the leaves of 2 onion, placed them on a foiled tray and burnt them under a hot grill until they were black – this worked well, other than the fact I kept setting off our fire alarm, with apologies to my neighbour downstairs. 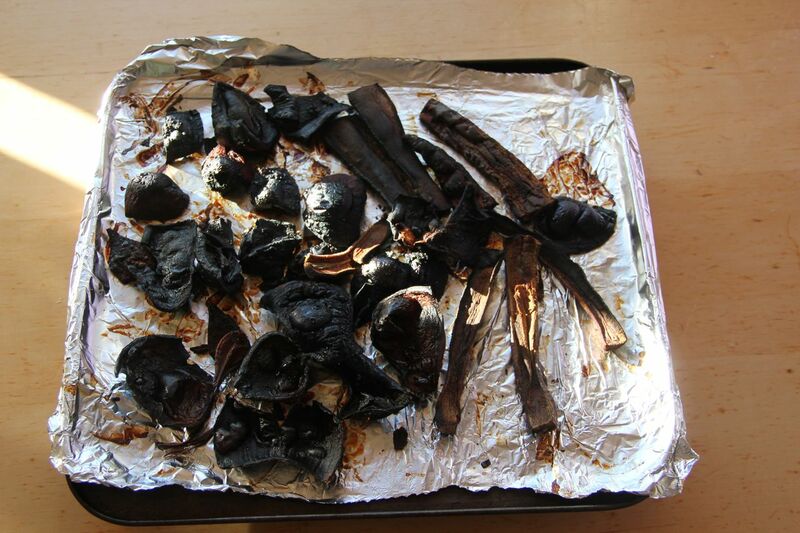 After burning on both sides, I put the charred vegetables into a 100C oven and slowly completely dehydrated them over the next 8-10hours. After they cooled, I packed them in an airtight container overnight and then pummeled them with our our mortar and pestle, along with a good amount of sea salt. 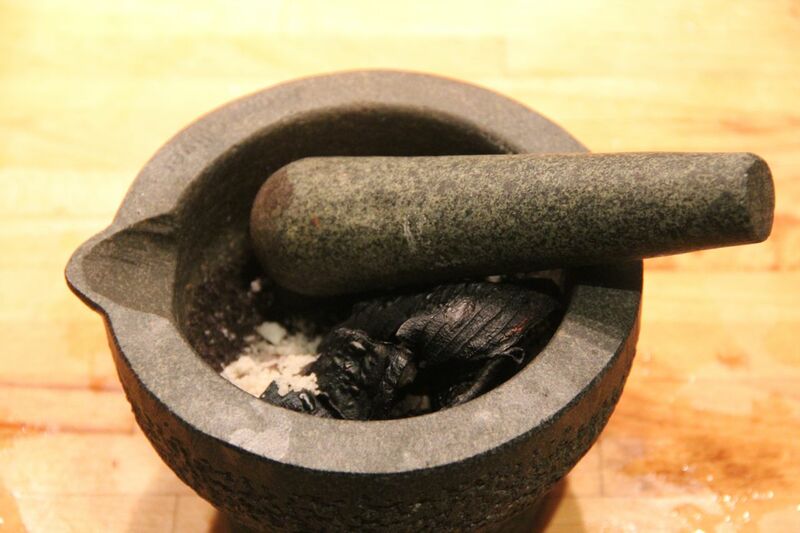 I ground the ash as fine as possible, and hope to put some on my cheese tonight. Ok, so it might be a bit premature to name my cheese. I’ve only made it once, but the name was given before it was even ready, so I think it’s here to stay. My blue doesn’t have quite as many veins as I’d like – more like a large blue blotch in the middle and occasional other patches – which suggests my stabbing may have mostly aligned at one central point, creating a large air pocket for the mould to grow. All the same, after almost 4 months aging in the fridge, I opened the foil and took a bite. It tasted a bit salty, a bit acidic and it was suprisingly good. It worked well with my membrillo. As you may recall, this cheese started life at my cheese course back in July, and was made from one hour old, still warm, cows milk – if only I had the luxury of that every time I made cheese. The curds were washed, which helped make a slightly softer taste than some other blues I’ve eaten and lightly pressed. 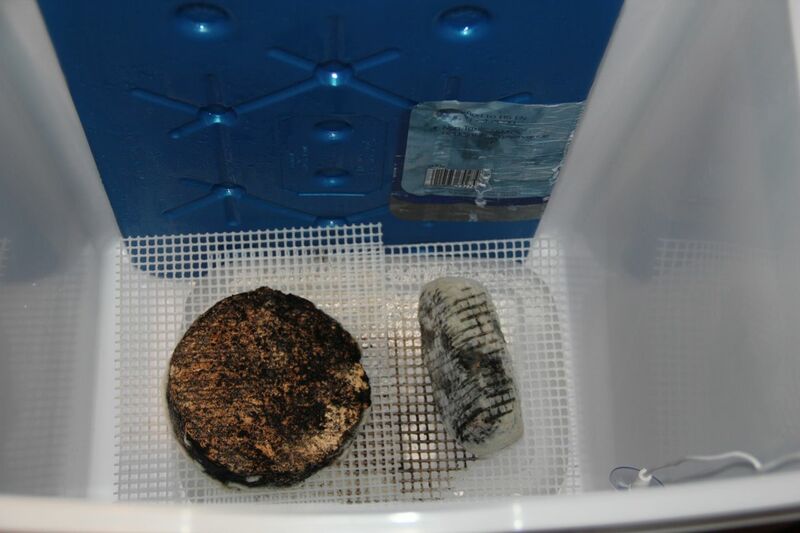 After drying and about a month of mould growth, it was then stabbed to allow oxygen to enter and aged in the frige. I might try a batch without washing next time, just to see how it differs. 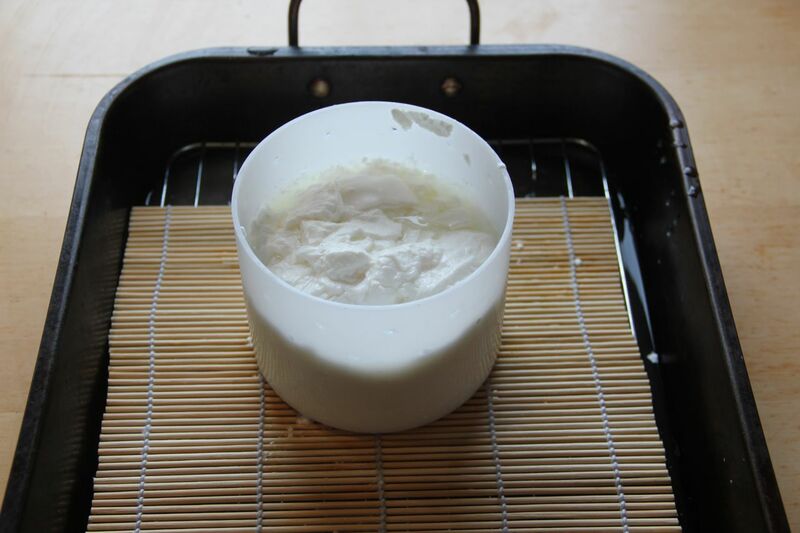 I’m just back from holidays again, so am thinking of trying to make some soft white mould cheese with goats milk this weekend. 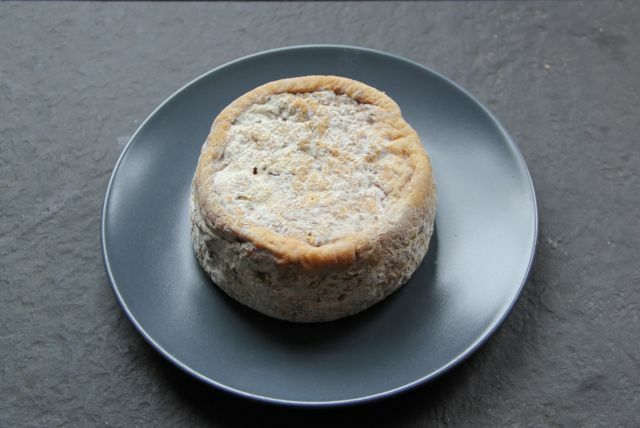 I recently found out about another south London cheesemaker, Handy face, who also blogs and he mentioned some raw goats milk that is easily available, so I think I’ll try to get some of that. Quinces are amazing. 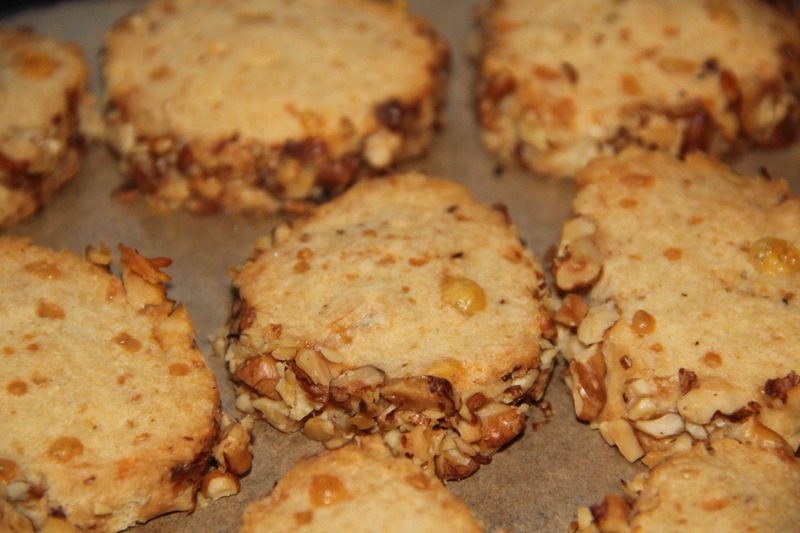 So knobbly, hard and yellow and then add a bit of water and sugar, and suddenly they are soft, red and lovely. They are only in season around October through December, so now is the time to get some (unless you are at home in the southern hemisphere, when I guessing you may need to wait until March or so). 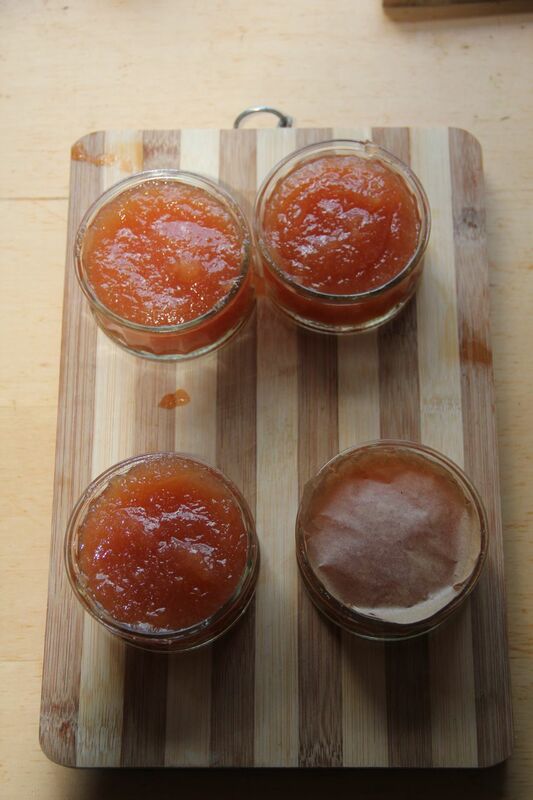 One of the easiest things to make is membrillo, a Spanish version of quince paste. 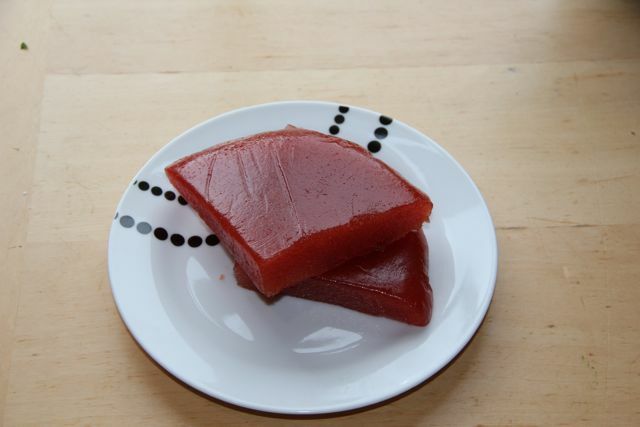 Membrillo is very, very good with manchego. I don’t have any manchego to hand but I do now have lots of membrillo. It’s listed in my preserving book as a fruit cheese section, so seemed like a nice addition to put here. We had a cheese afternoon last Sunday and it went well with the Bath Blue. It doesn’t really matter how many quince you use as the recipe is really about matching the weight with sugar. I used 3 large ones and got lots of membrillo. The steps are really easy. 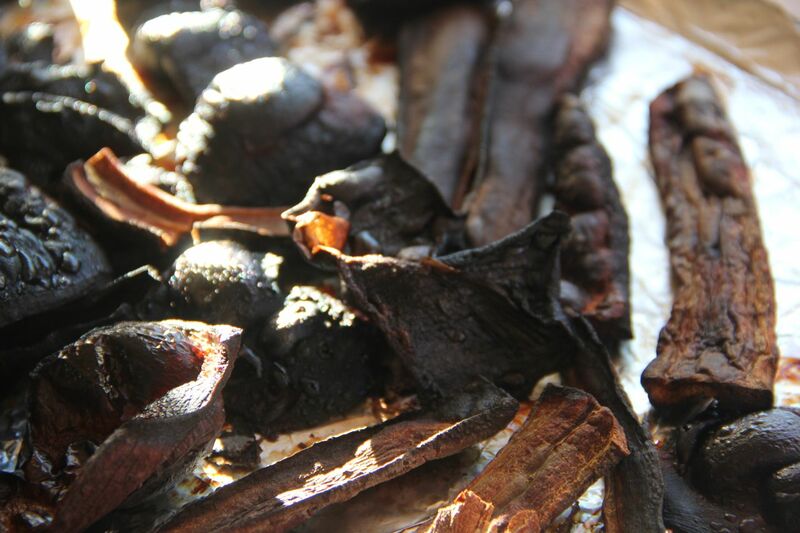 Wash your quince really well, quarter and cut out the core and hard, fibrous centre. You can peel as well if you like but as I’m a bit lazy I left the peel on and it cooked down completely. 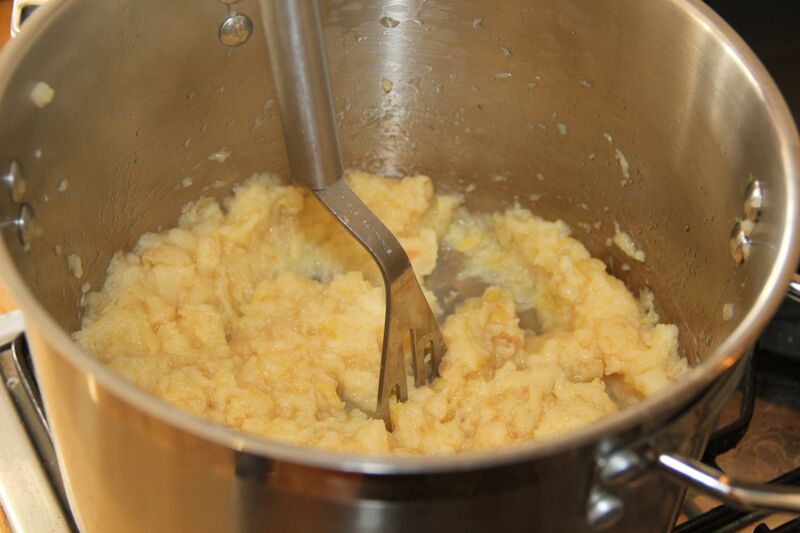 Chop up into smaller chunks and place in a large, heavy-based saucepan. Cover with water and add in a vanilla bean sliced open. 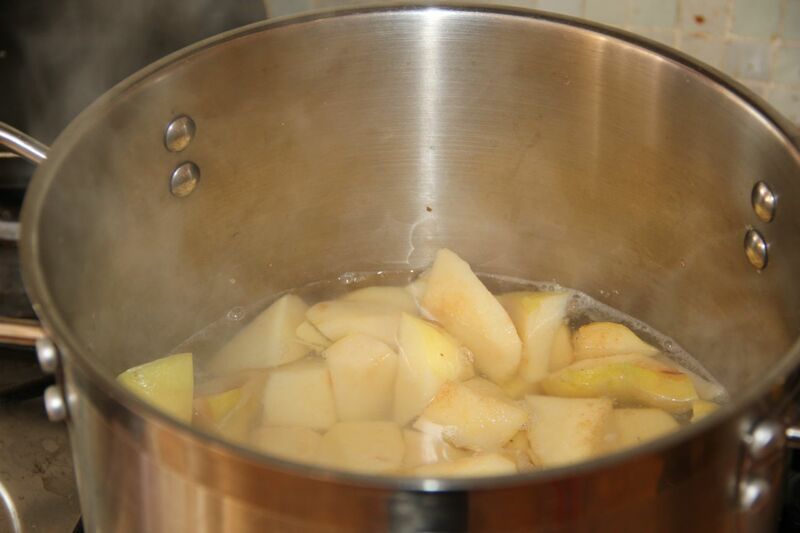 Bring the water to the boil and then turn it down to simmer for about 40 minutes or until the quince bits are soft and able to be easily mashed. 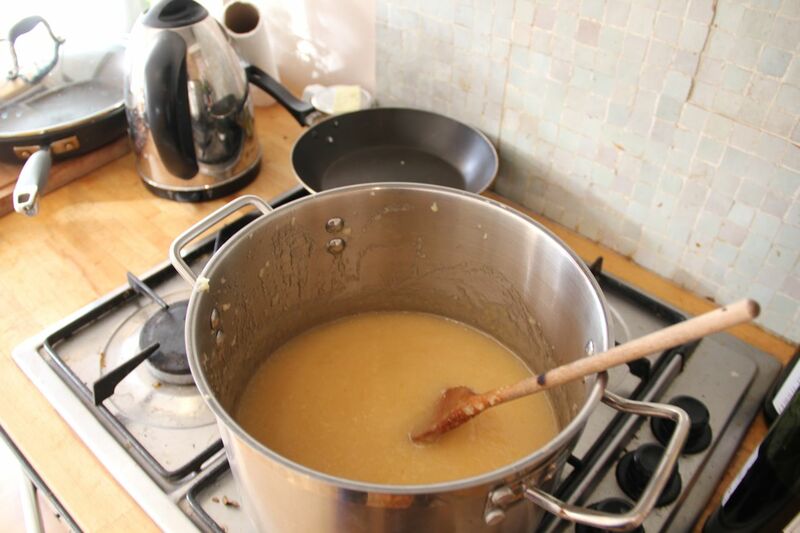 Put the equivalent weight of granulated sugar into the pan, stir and cook over a low heat until it had dissolved. 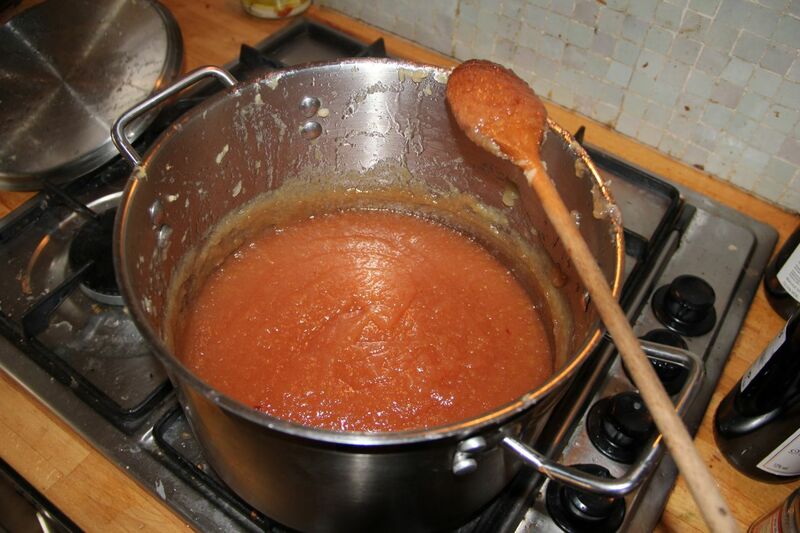 Then bring the mixture to a simmer and cook for around 45-60 minutes , until the paste has reduced, thickened and turned a deeper red colour. You should be getting plopping noises and be able to drag a wooden spoon across and and leave a trail. Once it has finished cooking, there are a couple of options. I know the first one worked, and I’m waiting to see on the second. The first option is to place the paste into a baking dish which is lined with greaseproof paper. Place this in an oven that has been preheated to about 100C and let it set there slowly over 2 hours. Once it is firm, remove from the over and let cool. You should then be able to remove the paper carefully, wrap the membrillo (either as a single block or in large pieces) in plastic wrap and place in an airtight container in the fridge. Various sources suggest this should keep for up to 1 year (I’m going to have to wait and see). The second option I have tried but don’t know the results yet. 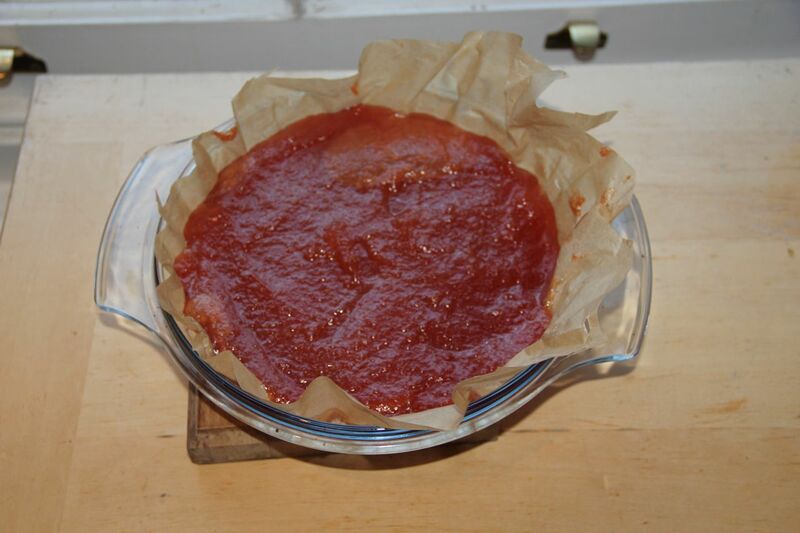 Place the paste in sterilised glass ramekins or jars. Leave to cool and then either tip out, wrap in waxed paper and leave to age for 4-6 weeks, or leave to cook into the jar/ramekin, seal and leave to age for 4-6 weeks, or longer. I’ll let you know how this goes once we eat some in December or at Christmas.